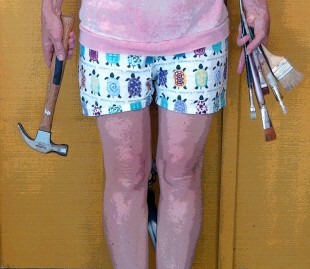 Welcome to my newly re-branded site “DIY Marta.” You may remember me from DIYpics.com. This is the same blog, just better. This site is a log of home and garden projects with detailed tutorials in photo and video format to help you “do it yourself and save.” The aim of this blog is to show how everything you do in the house and in the yard can be integrated in a way that creates very little waste and keeps living expenses at a minimum. Everything can be used and repaired and recycled and upcycled in a sustainable fashion, and you can do a lot of these home projects yourself if you want–with the help of a good tutorial. Translation into Portuguese is provided by clicking on the Brazilian flag at the top of the page. Blogmaster Marty (Marta) grew up in South America with her parents and seven siblings. She now lives on a bit of acreage in the Oregon high desert with her green-thumbed sister. There are always a ton of house and yard projects on the to-do list, so this blog is firmly grounded in the day-to-day challenges of keeping a home and garden in shape. Having to stretch the household income to make ends meet means they’re always thinking of money-saving ways to do the things that usually take a good deal of money. Oh, yes. Marty and her sister and are also artists (as was their mother). One of the nice things about being a project person and an artist is that most things around the property get used in ways they were not intended to be used. For example, Marty was working on two projects at the same time: her sister’s drip irrigation system, and a bicycle parts chandelier, and she discovered that the best thing you can use to stake down irrigation tubes are broken bicycle spokes. And since they’re free, that’s a great money-saving tip that gets passed on to you. We hope you browse this blog and take away something useful, something fun, and a new way to think about how you do what you do. If you need to contact Marty, enter your message below.